8 offbeat honeymoon destinations you’ve never heard of! Okay, it’s possible you might have heard about some of these places listed here, but be rest assured that none of them are anything like those cookie-cutter honeymoon destinations! We mean honeymooning in Switzerland, Paris, Phuket, Mauritius, Goa and Venice are just passé and so we won’t be talking about them. What's more magical than experiencing the magical Northern Lights with your loved one. Yes, you can go camping and stargaze under these lights. These natural red and green light phenomenon in the sky will definitely take your breath away. Picturesque landscapes, breathtaking panoramas, reindeer sleigh rides and husky sledding tours through the enchanting wilderness. Kakslauttanen Arctic Resort if you plan to experience this winter wonderland from your very own glass igloo! This place is the official Finnish home to Santa Claus. Tourists can tour the Santa Claus Village, get stamps from the Santa’s Post Office and even visit the Santa-themed underground amusement park. This romantic South-Pacific paradise features some of the most gorgeous sceneries around the world. You can book yourself a private island or go island hopping to explore the many magnificent islands that this country offers. White sand beaches, palm-lined shores, soft coral reefs, the world’s best snorkelling, scuba diving, under-sea life and island hopping (yes it's actually a thing here)! Many of the resorts in Fiji offer a “kid free zone" which cater specifically to couples on their honeymoon. You can indulge in their spa and massage packages to unwind after the tiring wedding festivities. This UNESCO-protected walled city of Dubrovnik is a must-see for its old world charm, maze-like streets, and ancient city walls. It hosts the widest variety of flavours, colours, and consistencies of olive oil and it is home to the world’s best black truffles. The city’s rich heritage and culture, ancient hill towns, crystal clear waters, tranquil surroundings, spectacular views of the Adriatic, olive oil tasting tours and truffle hunting are perfect for your romantic walks through the city! Four words, personalised ‘Games of thrones tour’! This historic city also doubles as King’s Landing! 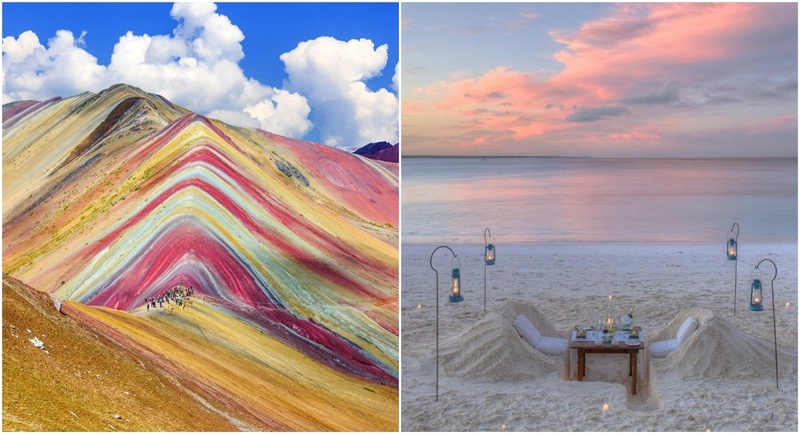 If rainbow mountains, taking quiet strolls in historic lanes, camping above 1200 ft is your thing, then you have to consider paying visit to this city in South America. Rainbow mountains, ruins of the city old city, luxury trains and sky-lodge hotels. With a combination of bush and beach safari, a honeymoon in Tanzania will be as wild as the honeymoon fantasies go. Authentix desert safari witnessing Africa’s big 5 - Elephants, Rhinos, Lions, Leopards and Buffalos. Lunch dates in the wilderness and gorgeous African sunsets. Oyster Bay resorts offer some of the best honeymoon experiences for the newlyweds. If winter romance is what you are aiming for then you have to pick this city for your honeymoon. From stargazing in northern lights, to watching the midnight sun and sleeping comfortably on an ice-bed in an ice-hotel, this city is a must-visit. And guess what, this is your last chance to see the northern lights clearly - or else wait for 11 whole years! Fishing, horseback riding, dog sledding, ice sculpting and skinny dipping in ice-cold water. It’s the only city in the world to cross two continents, offering the perfect blend of Europe and Asia at one place. You can start your together with a traditional Turkish Hamam bath, go crazy shopping in the afternoon and end the day enjoying the city’s vibrant night life. Cave resorts, blissful couple spas, sensual Turkish baths, romantic Fayton rides, lively bazaars, gorgeous beaches, hot air balloon rides over Cappadocia’s stunning valleys. Four Seasons Sultanahmet as it’s close to all the major tourist attractions. It’s a pristine island that forms the Bermuda Triangle known for the mysterious disappearances of aircrafts and ships. Before compiling this list, we really thought about whether or not to include this mysterious place and we decided why not? If you are a couple who doesn't care about all the mysteries and controversies surrounding the Bermuda, this is has to be your pick for an offbeat honeymoon destination. It’s a beautiful island with activities like glass-bottom catamaran rides available for couples. The moongate here is a huge attraction along with gardens lined with colorful flowers. Golfing in every per square mile available at the island, than in any other country in the world, some really cool diving experiences and pink beaches. The island is encircled with twenty-one miles of pink beaches to this otherwise green island. Any luxury resort which offers a couple’s spa package to relax after a long day spent on the beach and sun-bathing. So, to which place are you packing your bags to?